Alien: Isolation is an interesting game. It is the latest entry in a lineage of games that I refer to as horror simulators. It does an excellent job at creating tension and uses a lot of the knowledge built up over the years to great success. But, because it has such a laser focus on a certain type of play a bunch problems arise and other parts of the package suffer. It is a great game in many ways, truly excellent really, but there are some fundamental problems. These lead to, for me at least, a devastating flaw: At its core it fails to be a faithful emulation of the original Alien (1979) movie. Before we can properly discuss the game, we need to talk some video game history and design theory. Over the past, there has been two different schools of horror games. One that has a horror wrapping on top of standardized gameplay (horror wrapping) and one that tries to recreate the happenings of a scary movie/novel (horror simulation). The former is quite well known and started with games like Lurking Horror (1987). Mechanically, the game played like other contemporary adventure games, but took place in a scary setting with events meant to frighten the player. 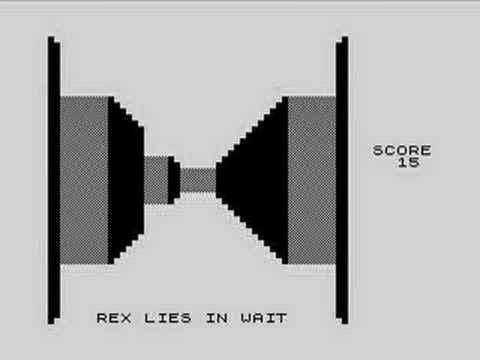 The latter one is a bit harder to nail down precisely, but I would say it started out with a 3D Monster Maze (1982), a game that is neatly captured in its name: the player is trapped in maze and needs to escape a monster (in this case a heavily pixelated T-Rex). While the horror wrapping design has thrived over the years, being a design corner stone for games like Phantasmagoria (1995, an adventure game), 7th Guest (1993, a puzzler) and Resident Evil (1996, an action shooter), the horror simulation is much rarer. After 3D Monster Maze, the next game to do it somewhat properly was Clock Tower (1995). It is now time to dig into the distinction between these two types of design. What sets Clock Tower apart from Resident Evil is that its core mechanic is not there to entertain, it is there to put the player in the shoes of a protagonist in a horror story. 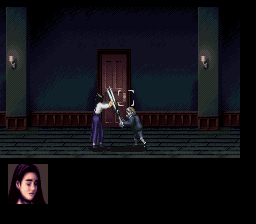 Clock Tower does this by having a single monster (little guy with giant scissors) hunting the player in certain scenes. The player can choose to hide in closets, under beds and hope that the monster does not find and kill them. Compare this to the core mechanic of Resident Evil, where the player needs to scavenge for ammo, weapons and health potions and then combat the monsters encountered. Resident Evil's gameplay could really work with any sort of theme and setting, while the one in Clock Tower is much more focused on being a horror experience. It is important to mention that Resident Evil does tons of things to crank of the level of scariness; scarce ammunition, inventory management, limited saves, etc. But none of these give rise to any specific horror scenarios; the game is still all about shooting various enemies in order to progress. There are very few sections in Resident Evil would fit a horror movie or novel, but Clock Tower is filled with these moments. The core difference can be summed up as Clock Tower being focused on having plenty of verbs that are related to a horror movie: hide under bed, looking into mirror, run away, push monster, etc. As the player plays the game, they reenact scenes of horror simply by following the rules set out by the gameplay. Resident Evil hardly does it all, the focus being much more on standard tactical combat with certain scariness attached to it. As a horror simulator, and really horror game in general, Clock Tower is not very successful though. First, much of the gameplay is actually pretty standard adventure game affair. Second, the actual chase moments are quite clumsy and frustrating to play, rarely resulting in any proper feelings of dread and terror. Despite these, quite major shortcomings as a horror simulator, Clock Tower is well worth studying. If you look past its flaws, there exists a focus on making horror elements playable that just didn't exist in games at the time. In fact, it is really hard to find similar games until quite recently. Hell Night (aka Dark Messiah, 1998) has the player running from a single monster and features cool stuff like a look-behind-you-button and having to carefully choose a companion. But it also suffers from lots of problems and is often a very frustrating experience. Even such horror classics such as Silent Hill (1999) have little focus on trying to do proper horror simulation. Most of the game is based around solving puzzles and fighting enemies (while running is sometimes advisable, most encounters are best handled through combat). Instead a lot of your typical horror moments are not simulated, but put outside of the player's control. 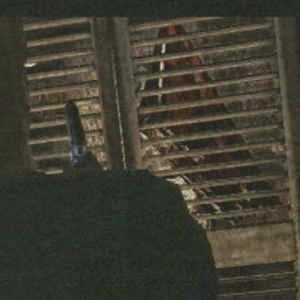 For instance, in Silent Hill 2 (2001), when the protagonist hides in a closet it happens in a cutscene. Remember, this is a scene that played out through gameplay in Clock Tower. If you look at the large body of the gameplay the player does in a Silent Hill game, little of it resembles what you would see in a novel or film. In fact, it resembles little of how a rational person would behave in similar scenarios. This does not make the games bad by any means, but it is a crucial concept to keep in mind. The games heavily rely on standard, often narrative-wise nonsensical gameplay in order to create the foundational engagement for the player. 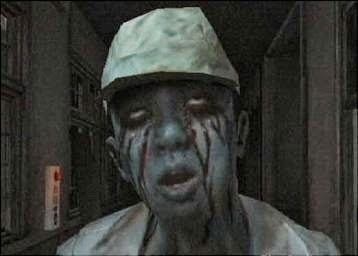 The next game, after Clock Tower, to really give horror simulation another proper go was Siren (2003). Here the player's actions are a lot more aligned with how it makes sense for them to act. For instance, it features a map without any indicator of the player position, and also allows you to see the world through the monsters' eyes. In all, it creates a much stronger sense of being inside a horror story. The problem with Siren, like Clock Tower, is that this focus amounted to a very frustrating experience, which in turn easily diminishes the overall immersion and scariness. Once again, this type of design didn't gain any traction. I now need to briefly discuss a design concept called "mental modeling". A concept that is closely related to the difference between horror wrapping and horror simulation. When you play a game like Resident Evil, every encounter is a very tactical and precise decision. You look at what kind of opponent you are facing, what weapons you have, the current ammo supply, health levels, etc. The model in your head is much less about the appearance of the creatures, and much more about pure numbers. This can be very stressful, and combined with a horror thematic the total experience can feel quite scary. But on the whole very little is left to the imagination and narrative-related intuition. In a game like Siren however, you are much more worried about what you cannot see, and your mind is racing with trying to predict future happenings. Combine this with a map that forces you to think yourself as part of the environment, and monsters that you mostly keep track of by inferring their position, and you get a mental model that is far more horror-like and vivid. The problem is that since you lack the sense of numerical certainty that Resident Evil supplies, it becomes much harder to formulate correct tactical decisions. This is a fact that I think has a part in making these kind of games so frustrating. It is clear that the mental modeling that Siren has is better suited for a horror game, but it was not yet working properly gameplay-wise. Now back to game history again. The release of Siren marks the beginning of the end for what I would like to call the golden age of survival horror. It had brought us gems like Resident Evil, Silent Hill, Fatal Frame (2001), all of which brought a very fresh take on the horror experience. But after that, the well seemed to dry up and horror games got increasingly action oriented. Resident Evil 4 (2005) really got this trend going. One reason for this change in focus is partly diminishing sales and increasing production costs. Another major – and connected – reason was almost certainly the lack of evolution in the genre. All of the big games had been based on horror wrapping, with most of the gameplay being quite standard. The wrapping did not allow for much change, and when the focus was put on the underlying mechanics, the horror rapidly faded. It took a while before anything new came along, and this is where we enter the picture. When we released Penumbra: Black Plague (2008), we made our attempt at doing a game without having any weapons. It had a bunch of issues, but showed promise in how it changed the player's perception of the game's world. The decision was based on lessons learned for Penumbra: Overture (2007) and from the linage of games discussed above. The following year sees the release of another combat-free horror, Silent Hill: Shattered Memories (2009) which also puts emphasis on crafting more of a horror simulation, but also manages to get a bit too frustrating. Upon releasing Amnesia: The Dark Descent (2010), there is one thing I am especially proud being part of creating. Simply by using the game's basic system, we can get the player to hide in a closet and fearfully watch as a monster pass them by. It felt like we basically managed to recreate, through gameplay, the closet cutscene from Silent Hill 2, and properly simulate one of the main mechanics from Clock Tower. I feel way too biased to say how much effect – if any – this had on horror games in general though, but for me personally I feel it is one of our biggest contributions to the genre. Two years later, the short and free game Slender (2012) is released and this what I think really kickstarted the horror simulation. Slender is a simplistic game with not much in terms of standard gameplay. The player is simply tasked to collect a few notes in an open, but still slightly maze-like environment. Where the game gets all of its engagement from is how it manages to simulate its horror. 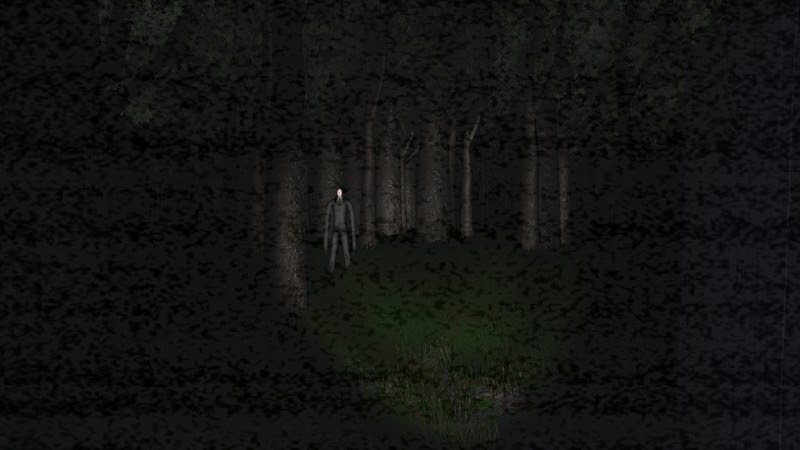 You cannot look at slender man, you have to move carefully, you cannot use your flashlight too much, you need to stay away from spooky sounds, etc. All of these gameplay elements are quite vague and together they give rise to a rich mental model. The end product is that you got a very engaging horror experience from almost nothing. Remember that Slender has very little story and interesting goals. It is all about existing inside a certain virtual space. It is all about raw horror simulation and little else. While other indie games like Hide (2011) have done similar things in the past, Slender proved it was really a viable method of making a game. If you just make things vague enough, and allow the player to play based on that vagueness, you can make engaging games of pure horror simulation. In some ways, Slender is sort of like the Super Mario Bros or Wolfenstein 3D of horror games, a distillation of what makes the genre work into its purest form. Since then a bunch of similar a games have followed, one of the most successful being Outlast (2013). The story in Outlast is paperthin: A journalist enters an old asylum where experiments are rumoured to have taken place, is met with the place being overrun and now has to escape. There are no puzzles, no standard gameplay, it is all a bunch of levels where you run or hide from insane inmates. Also included are a few breather levels where you simply walk to (or try to find) the next destination by going through some spooky environments. Scattered around are also documents detailing background lore, but you gain very little from reading them. You can pretty much go through the whole game ignoring them and still get a coherent narrative. What makes the game engaging is the situations that it puts you in. Hide from monsters in lockers, sneak past them as they talk gibberish, walk past weird looking denizens not knowing if they will jump you or not, try to make out dangers using grainy night vision camera, and so on and so forth. Almost any gameplay scene that plays out could be directly baked into a horror movie or novel. Outlast is a pure horror simulator, and a narrative naturally arises from the situations the game throws you in. And now, finally, we get to Alien Isolation. This is the latest breed of horror simulations, and a very successful one at that. The big feature in this game is that there is only one monster that can appear at any time. In many ways, it is really the 2014 version of 3D Monster Maze, in which the whole game was built around trying to figure out where the monster was located and how to avoid it. Alien: Isolation obviously has complexity far beyond that, but it is striking how similar the basics are. There are bunch of elements that all work together to craft a mental model that perfectly fits the game and make Alien: Isolation really scary. First off, like in any other horror game, the sound is vital and you need to constantly listen for clues. This can be cues from other survivors (who are hostile towards you), malfunctioning androids, or the alien monster itself. Not only do these paint a terrific ambient soundscape, but they are also very important for you in order to progress. You also need to be conscious about how much sound your own actions are causing. The game warns you to not use the notorious bleeping motion scanner too near people as they might hear you, and after that you get really paranoid about any sounds you might be making. On top of that, the save stations, which are crucial to locate, give off a faint and distinct beeping noise. As the environments are dark, and the stations can sometimes be found in a hard to spot location, you have another reason to listen carefully. The difficulty level in the game is quite harsh, and the tiniest mistake can lead to sudden death, so you are always eager to save the game. This leads you to listen extra carefully when you have gone a long way from a save, making you vulnerable to any other sudden noises. Remember those jump scare videos that told you to watch or listen extra carefully only to throw a spook at you when you least expected? It is sort of like that that, but without you feeling annoyed afterwards. 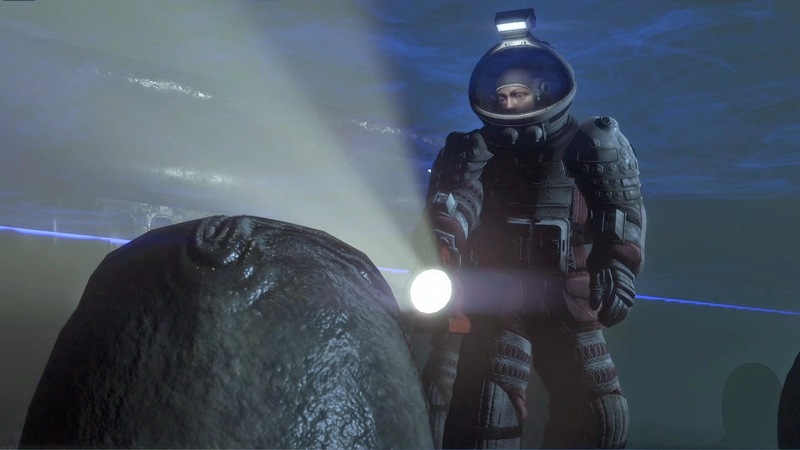 Add to the fact that the Alien can really appear anywhere in the game, and you get a mind model that is primed for picking up and seriously considering even the slightest sound. Because the alien feels so random in when and how it appears, it is hard to get a grip on what sort of signs to watch out for. The mind model becomes vague, and more prone to paranoid imagination, which is obviously great for a horror game. This is combined with the fact that unless you have one of the beefier weapons, if the alien spots you, you are dead. With no possibility to run away, the player gets very conscious about their movements, the alien's possible location, and – yet again – the sounds that they hear and might be causing. Combined with all this is an assortment of items (noise makers, flares, a revolver, etc) that all have pros and cons (eg flares light the dark, but also attracts attention) along with a certain interplay between the different types of hostiles. For instance, if there is a room with human adversaries you could throw a noise maker in among them, attract the alien and then have that kill them off. But that also means you now have an alien in your vicinity, which might prove more dangerous than the humans. And since the systems are vague, it is hard to predict outcomes and you live in this constant uncertainty. Another aspect I love is how the alien monster forces you to sneak. It is quite common in stealth games that you can simply lie in wait and club down patrolling hostiles, and that that tactic is far better than the (narrative-wise, better fitting) approach of sneaking past them. 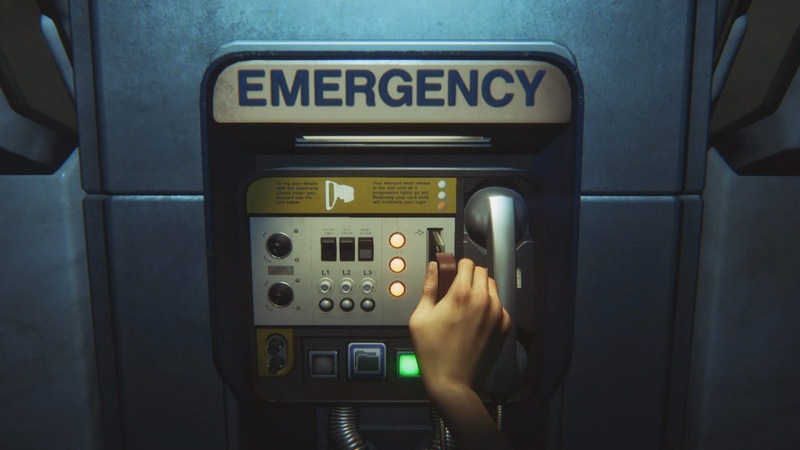 But in Alien: Isolation, you do not want to risk any sort of alarm, and staying hidden almost always feels like the better option. In turn this makes most humans that you encounter seem more alive. You mostly only see their vague outlines and hear their conversations from afar. In your head you a build much more vivid picture, since you are never pushing the game into displaying their often immersion breaking behaviors that occur when they are up-close. All these actions available coupled with the resulting mind model lead to gameplay spaces that properly simulates horror. Sometimes even unscripted horror shows play out in front of you eyes. For example, a band of survivors can be caught off guard by the alien as you hide in a locker and you end up staring at the onslaught terrified that the monster will come for you next. And like with Outlast, just about any scene that plays out would be fitting in a book or movie. A horror story unfolds as you play and is affected by your actions. And unlike similar games based on horror wrapping, eg Dead Space (2008), the actions that you do feel sensible and realistic. Apart from some more gamey mechanics like the save station and scrap collection, you behave just like a character would do in a movie or book version of the same story. This is horror simulation at its best. But this super focus on being a horror simulation, also starts showing cracks in the game as a whole. For instance, just like in older games of the same genre, Alien: Isolation can be very frustrating. The tension built up from being 20 minutes from your last save, quickly turns to anger and frustration when you are killed seemingly out of nowhere. While still vague (which is essential for giving rise to the right mind model), it is predictable enough for you to be able to get past any threats if you are just careful and cunning enough. Still, this part is divisive, as can be seen by the review scores and I have myself felt extremely frustrated with the game from time to time. There is a certain sweet spot in how to approach situations properly. Too aggressive, and you will die a lot. Too passive and the game's pacing gets messed up. The trick is to be able to move forward at a steady pace and still be cautious enough to avoid death. 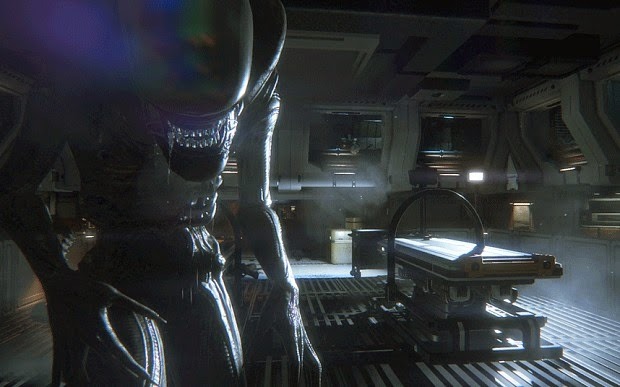 A way to fix this would have been to make the alien AI better adapt to the player's style, so if they hide a lot in lockers, it backs off quicker and keep things interesting and the pace at the right level. The developers should have probably focused a bit less on challenge alone to provoke a certain mindset and also have had some elements to dampen the difficulty for players that were behaving properly, but are being a bit too passive to get a good experience. While the frustration and bad pacing are clearly issues, I do not think they are that bad and, as noted above, it should be relatively easy to fix. What is a much bigger problem is how these system gives rise to a very simplistic narrative. The first part of the problem are the save stations. Having these are a crucial part of making it all work, partly based on the simple reason that after a little while you get too comfortable around the alien for it to be intrinsically scary. There needs to be some gameplay aspect that keeps the tension up, and keeps you in the right mindset. The save stations does just this. But the side-effect is that the save stations become the biggest objective for you as a player. Finding the power station that you need to activated is not at all as important as finding the next place to save. This means that your personal narrative becomes dumbed down, and ends up being a simple hunt for loot and save locations, without any thought on what the higher level fiction behind your actions really is. The problems with objectives does not stop there though. Another issue is that they are all extremely simplistic and without any interesting narrative significance. They are all about powering up things or finding keycards. It is old school mission design with a thin layer of narrative coating. While these sort of boring objectives are pretty common in games, I think Alien: Isolation has an especially hard time getting away from it. Because the game is constantly so dense with information that you need to keep track of (save stations, motion tracker, alien signs, loot, resources, etc) you really cannot manage to keep any complex objectives in mind. It is also crucial that the player has a good idea of where they should be headed, because too much disorientation and the mind model starts breaking down. This leads to basically decent objectives (eg find a keycard on a dead doctor by figuring out what rooms he has visited) becoming very handheld experiences, as the game constantly marks your next destination. The simple reason for this is that less hand holding would have made it too frustrating. You can see similar mission design in Outlast, and while I think there was more room for improvement there, it is a design decision that probably stems from the same issues. Another connected issue is that the notes and audio logs you find in the game never really feel that relevant. It is another issue similar to Outlast, although I find that the content was way more interesting in Alien: Isolation. But the real issue is that you cannot really have too much important information in these, because accessing terminals means a danger to the player. It is really hard to explore and think about the environments and backstory when you are constantly worried about the threats the game might throw at you. As you look closer at these flaws in Alien: Isolation, it becomes more clear that it really is just a pure horror simulator, like Slender or 3D Monster Maze, just with more sections to play through. The aim of this game is not to tell a longer horror story. The aim is to put the player in different scenarios involving hostile human survivors, creepy androids and/or an alien. Any interesting narrative then arises from how these scenarios play out. It has no real story at a higher level apart from the basic "get the hell out of there". There is nothing wrong with this of course, and the basics of the game works fine as is. But Alien: Isolation's issue is that it just goes on for too long. If you (like me) want to get some sort of deeper narrative experience from your game to keep going, the game wears thin after just a few hours. This is a bad thing for a game that last for at least 15 hours. Outlast takes about 5 hours to complete, and that feels like a better fitting length for this sort of gameplay. 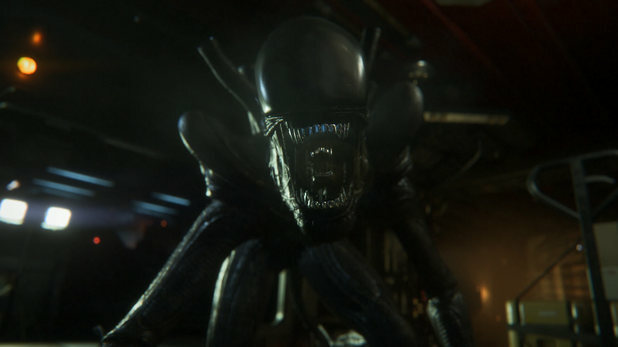 Alien: Isolation has another big problem. If you went in hoping this would be an interactive take on the first movie, you will be disappointed. Rather than being some sort of video game adaption of the original film, it is more like a version of Alien 3 or 4. The first movie is the birth of a monster, it is a long build-up of a creature followed by a final confrontation. It is much more about discovering some hidden lovecraftian horror, than about people fleeing for their lives from a well-established creature. So what the game ends up being about; sneaking from place to place, just constitutes a minor part of the movie, and is a far cry from replicating the experience. It is hard to blame the developers though. In order to deliver a similar narrative they would have had to rethink the alien quite a bit, and most likely diverge from the source material. Something that I wouldn't think Sega or 20th Century Fox would not be too happy about, as the creature is the game's foremost selling point. But even if we disregard that, it would be very hard to use the game's given form to emulate the make-up of the movie. If we trace the game's gameplay lineage way back to Monster Maze, we see very little about the other things that make the movie so great. All of these games are about putting the player in a predefined situation and to let that play out. The great strength of the genre is to provide the thrills of being the hunted, and to have a super focus on this. 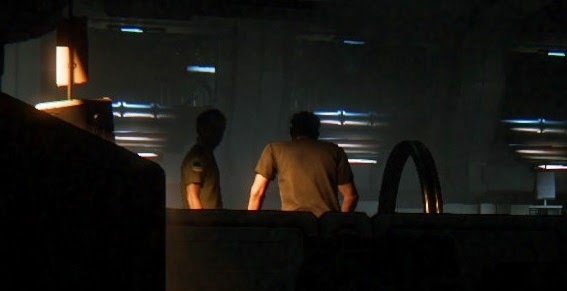 Alien: Isolation does do some attempts to better replicate the source material. For instance we are taken on an expedition to the iconic derelict spaceship, but for me all of this falls flat. The eggs, facehuggers, and all that are already so well established that you never get a sense of mystery from it all. Worse still, this section differs so much from the movie – which comprises of sneaking about – that there is no tension. The game has trained you to look for save stations, be aware of your resources, listen for certain sounds, etc in such a specific way that when you are taken out of this space, the game loses a lot of its impact. I think that horror simulation is the sort of design we want to strive for when making horror games. I love how it is possible to set up scenarios where the player gets to experience terrifying scenes, fitting for a horror movie or novel, simply by playing. This is the sort of storytelling that we want from games, and I do not think going back to merely using horror as a wrapping is a good idea. However, it is pretty clear that there is a big problem here. Horror simulation as it is currently done, is very limited in what it can let the player do, and what higher level narratives it can tell. We had similar issues in Amnesia: The Dark Descent. When playing the game, all you do is go from room to room, solving puzzles and avoiding monsters. But as you read about the backstory you hear about opening tombs in the desert, the first visit to the Brennenburg castle and much more. All of these are moments that an ideal horror game should have let the player play, not just read about in some diary entries. The issue is not just to recreate these sort of scenes, but to make sure the experience is fitting. 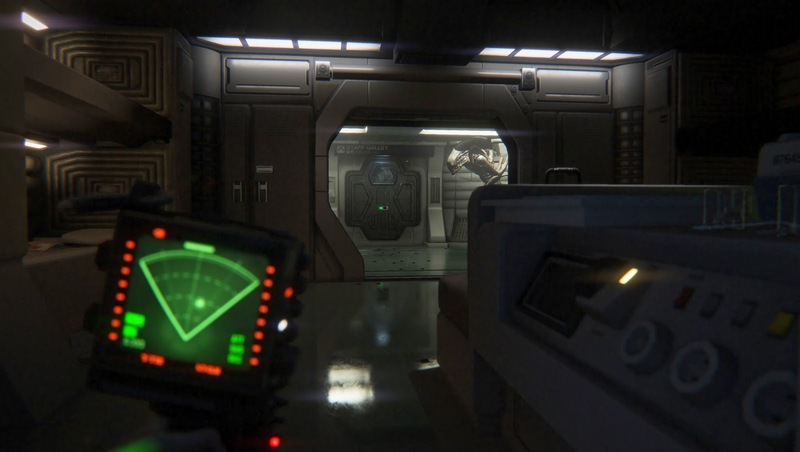 As can be seen in Alien: Isolation, the trip to the planet lacks the immersion that the sneaking around has. When you try and hide from the alien, your mind model is aligned with was happening and you act like a protagonist would do. But when visiting the derelict spaceship, you could have just as well been watching a cut scene. There needs to be something more in order to properly bring this sort of scenes into the standard that proper horror simulation has set. First of all I think there needs to be more restraint on how much of the basic gameplay is used. Even though Outlast takes about 5 hours to get through, it has a hard time keeping the gameplay fresh and the tension up throughout. For me, the game started to feel slightly drawn out the last third or so. Amnesia also suffered from this. Enemy encounters got pretty predictable and less scary after you had gotten through half the game. While the exact time at which this sort of gameplay stops feelign engaging is highly subjective, I think most can at least agree that the less practice you get with the encounters, the more intense they feel. Therefore lies in the best interest of a horror game to use its monsters sparingly. Second, there needs to be much less reliance on difficulty in order to build the proper mind model. The way that games like Alien: Isolation and Siren are set up really increase the tension, but it does so at the cost of making the game's scope very narrow. As explained above, it is hard to have much else going on in order for the player to enjoy the experience. Also, as soon as you remove any of these elements that rack up challenge (like save stations) a lot of the tension goes away. What games like these are after is to couple the sensation of stress of losing progress together with a firm horror setting. The psychological effect is that the player takes the tension they are feeling and projects it on the frightening visuals and sounds. But building purely on this is a fragile structure as it means you always need to present a mechanical device of stress to the player, and this leaves out a lot of horror scenarios. I think that the answer lies in having some sort of uncertain outcome as an ingrained gameplay device. Instead of having the player fear "what if I lose my progress?" they should be thinking "what if I affect the world in a negative way?". This is a kind of thinking that can be applied to a much wider range of things. Probably the best example of this in action is the Walking Dead (2012) series. Here one can clearly see the range of scenes that can have tension, purely based on an uncertain outcome. 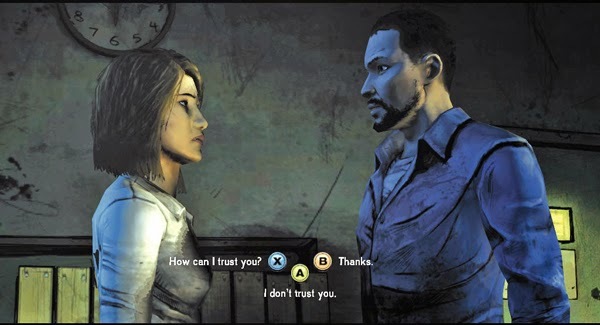 And what I especially like is how personal the choices can be, eg deciding between which person gets your trust. The most apparent problem with this sort of gameplay though is that it requires branching, but this is not as big of an issue as it seems. Walking Dead has in fact very little branching, but even if you know this, you still feel tension by the choices. There is still enough uncertainty for you to feel immersed and care about the decisions. However, Walking Dead is quite different from how a horror simulator works- In a horror simulator the player needs to be in control most of the time, and cutscenes should be minimal. So it is not possible to just rip out the mechanics and apply them as is. What we need to do is rethink how choices can be set up and what the effects can be. We did some very early testing of this in Amnesia: Dark Descent and its free extra story Amnesia: Justine (2011). In The Dark Descent we have no proper choice, but there are some slight consequences to failure. If the player is killed by a monster, the world is slightly changed. This was not enough to be on the level of the tension gained from fear of losing progress, but it gained a certain level of uncertainty that helped to keep some of the fear. In Justine we also tried having optional puzzles, that resulted in a person getting killed if you failed. This also worked pretty well, and it meant that puzzles – a previously pretty separate element of gameplay – got more of a horror simulator feel (somewhat recreating scenes from movies such as Saw). These are just small things though, and the big problem is to have it work on a larger scale in a smooth, coherent manner. I think the first step is to see if you could remove the penalty of death from standard sneaking gameplay, but still retain the same sense of tension. There are three big things to gain if this can be achieved. First, to remove a lot of the inherent frustration connected to the "fear of progress loss"-design, and have less risk of breaking immersion. Second, it will allow for more integration of exploration and more complicated objectives, as you remove the forced repetition coming a design based on difficulty. Third, it will give us a glimpse of how we expand the horror simulator and have it cover things beyond sneaking by and hiding from monsters. My hope is that we then could take a stab at making a proper horror simulation, a recreation of experiences like in the original Alien movie. This is what we are currently experimenting with in our upcoming game SOMA. Since I do not want to spoil the system I cannot go too in-depth on our approach, but I can give a basic outline. The idea is that by having choices inserted directly into the game world and have the way you chose to handle these change how the narrative unravels. These choices can simply be whether you interact with a certain object or not, or it can be more vague things, like how you behave around a certain creature. The narrative effects will not be any sort of heavy branching, but smaller things things like making upcoming sections scarier (eg by removing lights), killing people you encounter, changing the way you perceive a character or even how you feel about yourself. Our hope is that by having these sort of decisions as an integral part of the game world, that the player internalizes them and makes it part of their mind model. Then, just like the tension you feel by wondering where the next save station is in Alien: Isolation, you will feel tension by pondering what ramifications a certain set of actions might have. This is just a little step forward, and until we release the game, we will not know how well it works. I do think it is crucial that we start to think about these things though. Just as the horror genre stagnated in the mid 2000s, because horror was merely a wrapping, the same might happen if we fail to move beyond "chased by monster" scenarios. While there is nothing wrong with these sort of games, I think it would be foolish to be satisfied with just that. There is so much more to explore in horror, and the success of recent horror simulators gives me hope that video games can handle it. My article about the 4-layers approach towards narrative design, has more on mind model stuff. Before playing Alien: Isolation I wrote an article and the problems it might have, that should be interesting to read too. I think some of my predictions, but I really underestimated how scary the alien could feel despite being a well-known creature. Chris Pruett's 2-factor theory on horror, ties into some of this stuff. Check out the basic background here and how it applies to games here.